With the back to school season approaching, my family is looking for easy weeknight meal solutions. By spending less time in the kitchen, we can enjoy other after-school activities together. Now through August 29, 2016, each 14.5 to 15 ounce can of Chef Boyardee is on Rollback at Walmart for only $0.80! Purchase five cans for $4 in a variety of flavors that include: Mini Ravioli, Beefaroni, and Spaghetti and Meatballs. You can enjoy a week’s worth of quality meals at an affordable price. 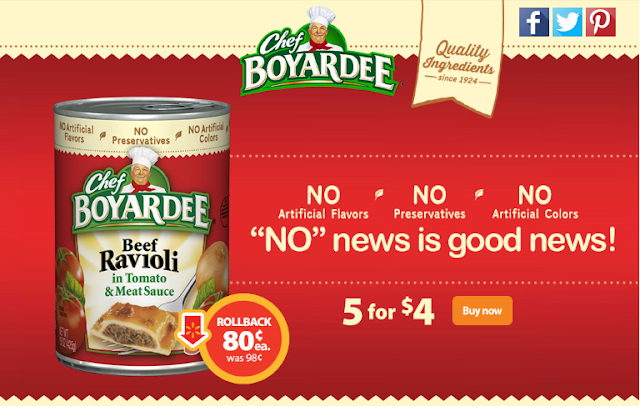 Be sure when you stock up on Chef Boyardee at Walmart to look for the Chef Boyardee cans that feature NO artificial flavors, NO preservatives, and NO artificial colors. With quality ingredients since 1924, Chef Boyardee has been a pantry staple for many families. While shopping at Walmart, be sure to look for the Rollback signs for Chef Boyardee in the Canned Food aisle! My kids love these, I'll have to stock up! Thanks!